Objective To observe intracranial pressure in women with idiopathic intracranial hypertension who follow a low energy diet. Setting Outpatient department and the clinical research facility based at two separate hospitals within the United Kingdom. Participants 25 women with body mass index (BMI) >25, with active (papilloedema and intracranial pressure >25 cm H2O), chronic (over three months) idiopathic intracranial hypertension. Women who had undergone surgery to treat idiopathic intracranial hypertension were excluded. Intervention Stage 1: no new intervention; stage 2: nutritionally complete low energy (calorie) diet (1777 kJ/day (425 kcal/day)); stage 3: follow-up period after the diet. Each stage lasted three months. Main outcome measure The primary outcome was reduction in intracranial pressure after the diet. Secondary measures included score on headache impact test-6, papilloedema (as measured by ultrasonography of the elevation of the optic disc and diameter of the nerve sheath, together with thickness of the peripapillary retina measured by optical coherence tomography), mean deviation of Humphrey visual field, LogMAR visual acuity, and symptoms. Outcome measures were assessed at baseline and three, six, and nine months. Lumbar puncture, to quantify intracranial pressure, was measured at baseline and three and six months. Results All variables remained stable over stage 1. During stage 2, there were significant reductions in weight (mean 15.7 (SD 8.0) kg, P<0.001), intracranial pressure (mean 8.0 (SD 4.2) cm H2O, P<0.001), score on headache impact test (7.6 (SD 10.1), P=0.004), and papilloedema (optic disc elevation (mean 0.15 (SD 0.23) mm, P=0.002), diameter of the nerve sheath (mean 0.7 (SD 0.8) mm, P=0.004), and thickness of the peripapillary retina (mean 25.7 (SD 36.1) µ, P=0.001)). Mean deviation of the Humphrey visual field remained stable, and in only five patients, the LogMAR visual acuity improved by one line. Fewer women reported symptoms including tinnitus, diplopia, and obscurations (10 v 4, P=0.004; 7 v 0, P=0.008; and 4 v 0, P=0.025, respectively). Re-evaluation at three months after the diet showed no significant change in weight (0.21 (SD 6.8) kg), and all outcome measures were maintained. 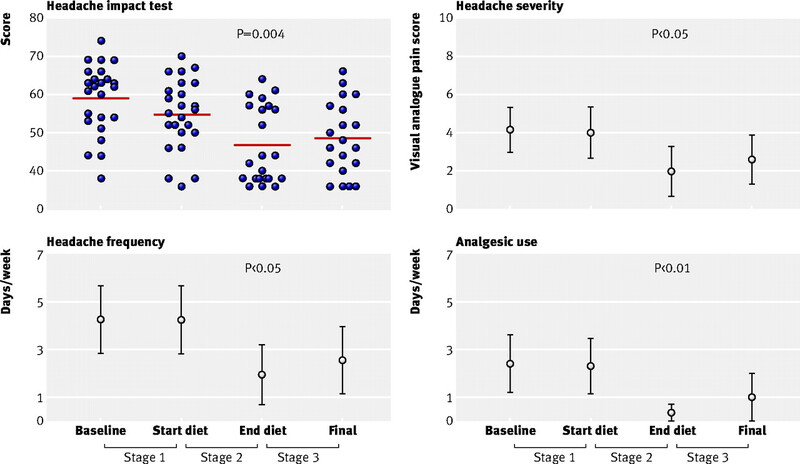 Conclusion Women with idiopathic intracranial hypertension who followed a low energy diet for three months had significantly reduced intracranial pressure compared with pressure measured in the three months before the diet, as well as improved symptoms and reduced papilloedema. These reductions persisted for three months after they stopped the diet. There is insufficient evidence to guide therapeutic strategies, as highlighted in the 2005 Cochrane review.4 The condition has a striking association with obesity (greater than 93%),5 and consequently weight loss is often suggested as a treatment. Nevertheless, there has been only one previous prospective weight modifying study, carried out 35 years ago, which observed subjective improvement in the papilloedema in nine patients on a low calorie rice diet6; these findings were supported by retrospective review of case notes.7 8 9 These studies relied on subjective observation of papilloedema and included people with newly diagnosed idiopathic intracranial hypertension, many of whom improve irrespective of any treatment given. Furthermore, they did not monitor concomitant changes in intracranial pressure with either weight loss or resolution of papilloedema. We carried out a detailed examination of the interplay between weight loss in patients with idiopathic intracranial hypertension with objective measures of papilloedema and visual function, headache scores and, crucially, changes in intracranial pressure. Women with idiopathic intracranial hypertension were identified and recruited from the Birmingham and Midland Eye Centre, University Hospitals Birmingham NHS Foundation Trust, and University Hospitals of Leicester NHS Trust. Idiopathic intracranial hypertension was diagnosed according to the modified Dandy criteria,10 with all patients having normal findings on magnetic resonance imaging and venography, papilloedema, intracranial pressure >25 cm H2O, and duration of disease over three months at enrolment. Women were excluded if they had undergone previous cerebrospinal fluid diversion or optic nerve sheath fenestration, were pregnant or planning to conceive, had relevant comorbidity, or were aged less than 16. All women who met the inclusion criteria were invited to take part in the study. Twenty five women were prospectively recruited into a three stage study. Stage 1 was a three month period of no new intervention (control phase); stage 2 comprised a three month intensive diet; and stage 3 was a three month follow-up after completion of the diet (fig 1)⇓. Weight loss was achieved with a previously validated,11 nutritionally complete, low energy, total meal replacement liquid diet (Lipotrim, Howard Foundation, Cambridge), which provided women with a total of 1777 kJ/day (425 kcal/day). Patients were advised to consume no additional food, and drink at least 2 litres of fluid a day. During stage 2 all participants underwent weekly review conducted at the Wellcome Trust Clinical Research Facility at the University Hospitals Birmingham NHS Foundation Trust. Compliance with the diet was monitored through evaluation of weight lost and presence of urinary ketones (a feature of abstaining from food intake). Participants were also regularly encouraged, through the provision of weekly nutritional counselling. 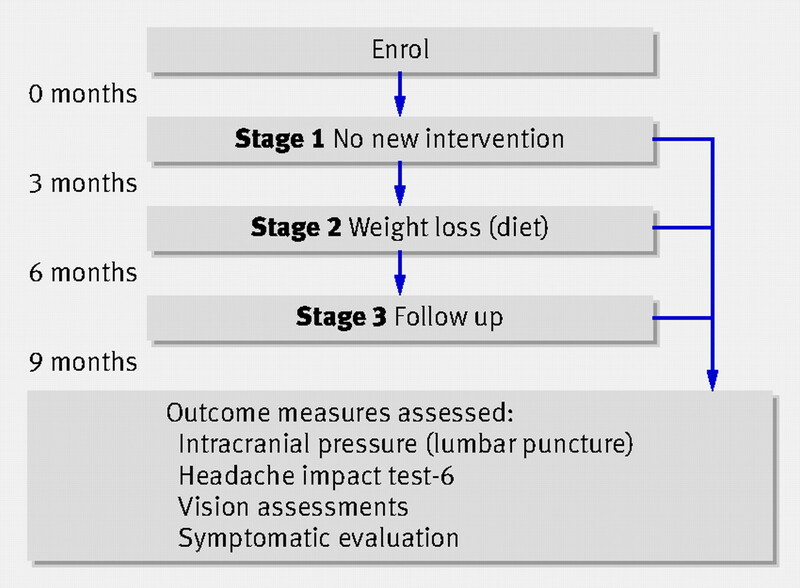 Intracranial pressure was measured by lumbar puncture at baseline and at the end of stages 1 and 2 after all listed outcome measures had been assessed. Measurements were taken with the patient breathing steadily in the left lateral position, legs extended greater than 90° at the hip, with adequate time taken to ensure a stable reading. Statistical analysis was performed with SPSS for Windows version 15.0 (SPSS, Chicago, IL) and Prism for Windows version 5.0 (GraphPad Software Inc, San Diego, CA) software packages. Data were reported with means and standard deviations. Serial measurements were analysed with repeated measures: analysis of variance (for parametric or log transformed data) or Friedman’s test, with post hoc evaluation achieved with a Wilcoxon signed rank test (for non-parametric data). We analysed dichotomous variables with a Cochran’s Q test, and evaluated changes in categorical data with the sign test. Associations between clinical parameters and objective outcome measures were analysed with Pearson’s correlation for parametric data and Spearman’s rank correlation for non-parametric data. Data were analysed only if present at all time points for each individual. The level at which the results were judged significant was P<0.05 (or P<0.017 for Wilcoxon signed rank test and Sign test as three pairwise comparisons were being made per variable). As data for the right and left eye correlated significantly and yielded analogous results, we have presented only right eye data. Of 37 women identified, 25 agreed to take part and 12 declined because of concerns about repeated lumbar puncture. All 37 women had homogeneous characteristics. Among those who agreed to take part, one woman was subsequently excluded as she was found to have a secondary cause of raised intracranial pressure, two did not complete stage 2 of the study as they could not tolerate the diet, and two were lost to follow-up at the final study visit. Women who withdrew from the study had similar clinical and anthropometric characteristics to those remaining in the study. Table 1 shows participants’ demographics⇓. During the study 11 (44%) patients received an unchanging dose of acetazolamide. No other drugs for idiopathic intracranial hypertension were used. There were minimal side effects associated with the low energy diet: constipation (three patients), light headed feelings (ameliorated by increased fluid intake) (two), and halitosis (one). None of the women underwent diversion of cerebrospinal fluid or fenestration of the optic nerve sheath during the study. As expected, none of the measured variables altered significantly during stage 1 (no intervention). After the low energy diet (stage 2), mean weight fell by 15.7 (SD 8.0) kg (P<0.001; −15.3% (SD 7.0%) of weight) and mean intracranial pressure by −8.0 (SD 4.2) cm H2O (P<0.001) (fig 2). 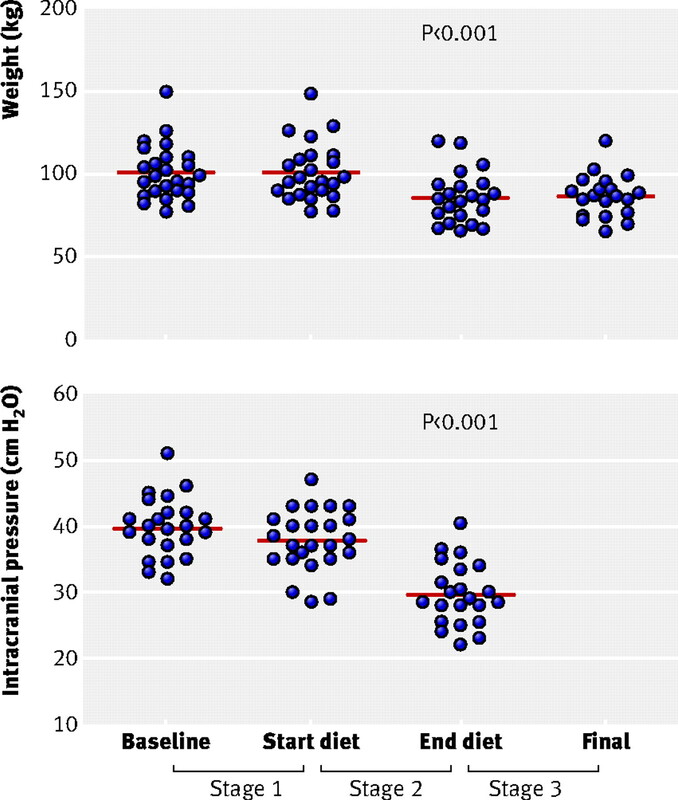 [f2] Although all women lost weight and reduced their intracranial pressure, the change in pressure during the low energy diet did not correlate with change in weight (r=0.280, P=0.209) nor with changes in any of the other outcome measures. At the final visit three months after the end of the diet (end of stage 3, table 2), all outcome measures including weight (0.2 (SD 2.5) kg, P=0.894) were unchanged, with the exception of headache symptoms (P=0.002), papilloedema (nerve sheath diameter −0.4 (SD 0.8) mm, P=0.035, and disc elevation −0.07 (SD 0.15) mm, P=0.059), and mean deviation of the Humphrey visual field (1.2 (SD 2.0), P=0.009), which continued to improve. In this small prospective study, women with idiopathic intracranial hypertension who followed a low energy (calorie) diet for three months had significantly reduced intracranial pressure compared with pressure measured in the three months before the diet (headaches and papilloedema also significantly improved). In the three months after the diet ended, weight loss was maintained and improvements in headache, papilloedema, and vision persisted. These findings suggest that weight reducing diets can help in the management of idiopathic intracranial hypertension. In four of the 20 women, intracranial pressure fell to a “normal” level (below 25 cm H2O). In the 16 women whose intracranial pressure remained above 25 cm H2O, 13 became asymptomatic for tinnitus, visual loss, diplopia, and visual obscurations after weight loss, compared with four at baseline. These data highlight that it might not be necessary for people with idiopathic intracranial hypertension to reduce their intracranial pressure to below defined normal levels to achieve measurable symptomatic relief. This might, however, be an overly simplistic concept as obesity is known to marginally increase intracranial pressure,16 and the equilibrium of cerebrospinal fluid dynamics in resolving idiopathic intracranial hypertension might be re-set such that apparent normality occurs at higher pressures. There was also an absence of a direct relation between weight loss and change in intracranial pressure, potentially suggesting a more complex relation, which could be influenced by a weight threshold for raised intracranial pressure in individual patients. Papilloedema, objectively measured with optical coherence tomography, ultrasonography of optic disc elevation, and optic nerve sheath diameter, as well as symptoms (headache, tinnitus, obscurations, and diplopia), all significantly improved after the low energy diet. Papilloedema continued to resolve during stage 3, despite weight remaining stable. This probably reflects a relatively slow resolution of optic disc axonal distension and oedema after reduction in intracranial pressure. Delayed resolution of papilloedema is also noted after normalisation of intracranial pressure after cerebrospinal fluid shunting for idiopathic intracranial hypertension (that is, the papilloedema resolves over a period ranging from three weeks to seven months after surgery).17 The headache impact score, which was substantial at baseline (57.5 (SD 9.0)), significantly improved after the low energy diet (P=0.004) to a level that had no or little impact on daily life (46.9 (SD 10.1)) (disability quantification from www.headachetest.com/HIT6translations.html).18 A subgroup of women (eight out of 20) continued to report disabling headaches after the diet, characterised by a score of >50 on the headache impact test-6, despite a reduction in weight and intracranial pressure equivalent to that of the whole study cohort. Alternative headache phenotypes such as migraine could account for the headache morbidity in these women. This was a small study with only 25 patients, which inevitably leads to limitations in interpretation. Because of the intensity of the low energy diet intervention and the detailed clinical protocol, however, performing a study in large numbers of patients before this prospective cohort study might not have been ethically viable. 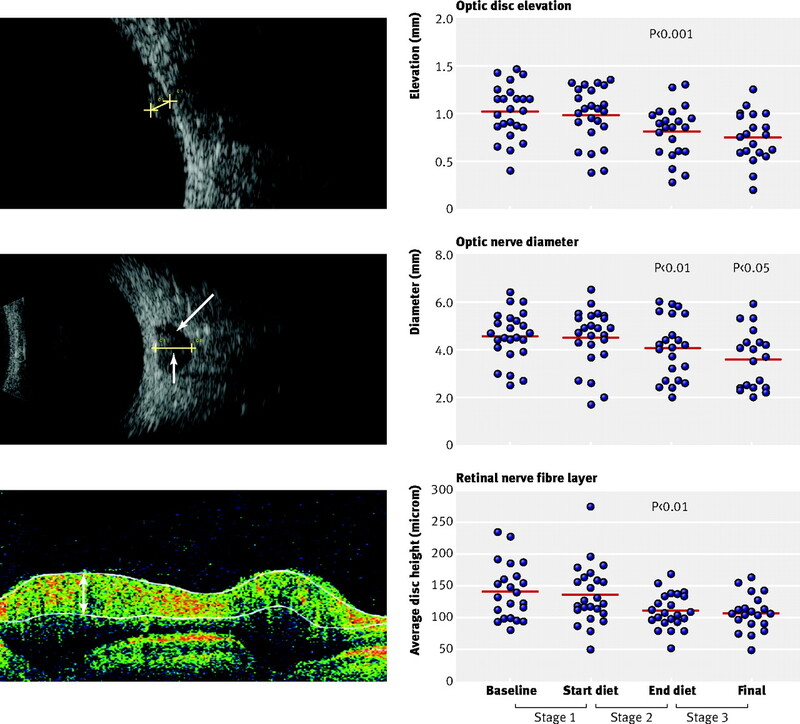 Evaluation of papilloedema in previous therapeutic studies of idiopathic intracranial hypertension has relied on subjective observation; our use of previously described objective imaging measures27 28 marks an important advance in gauging optic disc swelling that will enhance research and contribute to future clinical trial design. We acknowledge that lumbar puncture, which records only a snapshot assessment of intracranial pressure, is not as accurate as 24 hour continuous monitoring, which reflects diurnal fluctuations in intracranial pressure. The minimal changes in intracranial pressure reported over stage 1 (−1.8 (SD 5.5) cm H2O without intervention), however, indicate that the variability in intracranial pressure did not significantly influence our data. We recognise that the non-randomised controlled nature of our study design needs to be taken into account when evaluating these data. Patients’ acceptability and ethical considerations prevented recruitment to a control cohort (which would require serial lumbar puncture—a procedure with associated morbidity). Although our study, like other observational case series, might have been prone to unrecognised bias, confounding factors, or, potentially, overestimation of therapeutic magnitude, a rigorous study design like ours can minimise these potential limitations.29 A major strength of this study is that all patients had chronic stable idiopathic intracranial hypertension (mean disease duration 39.0 (SD 49.2) months). This reduced the risk of bias from the possibility of rapid spontaneous resolution, which is a recognised phenomenon in some patients with acute idiopathic intracranial hypertension. A consequence of selecting a chronic cohort was that visual impairment was minimal and papilloedema was mild (Frisen grades all ≤2) in most women at enrolment. We did not include patients with a history of rapidly declining vision requiring cerebrospinal fluid diversion surgery or other aggressive treatment. Visual function (LogMAR score and Humphrey visual field) was preserved at baseline in our participants, and a clinically important improvement was not noted nor expected. Despite studying a cohort with chronic idiopathic intracranial hypertension, we observed clinically and statistically significant improvements in symptoms and papilloedema. The only previous prospective study of therapeutic weight loss in idiopathic intracranial hypertension merely assessed subjective changes in papilloedema and included only nine patients.6 We not only used objective measures to quantify changes in papilloedema but additionally observed intracranial pressure in patients after a low energy diet. After a low energy diet, women with idiopathic intracranial hypertension had significantly reduced intracranial pressure, headaches, and papilloedema. Our findings suggest that advising and encouraging such patients to embark on and maintain a weight reducing diet could be of therapeutic benefit. Weight loss clinics could have a role in the management of idiopathic intracranial hypertension, though the long term effectiveness and heath economics of this approach will require critical evaluation in a further study comparing weight reduction using NHS dieticians with specially designated weight reduction clinics for patients with idiopathic intracranial hypertension. We thank Jonas Brane, medical illustrations technician, Sandwell and West Birmingham Hospitals NHS Trust, for his help with the fundus photography. Contributors: AJS was responsible for study conception, design, recruitment, analysis, interpretation of the data, and drafting of the article. MAB, JT, and PMS were responsible for study conception, design, and interpretation of the data. AKB and CRC, were involved in study design. PGN advised on data analysis. PG conducted the ultrasonography. AJ, TDM, and ML facilitated study recruitment. EAW was involved in study conception, data analysis, manuscript redrafting, and decision to submit the manuscript. SR was responsible for study conception, design and interpretation of the data, manuscript redrafting and decision to submit the manuscript, was principal investigator on funding grants, and is guarantor. All authors critically revised the article. Independence: The funding bodies and study sponsor (University of Birmingham) had no involvement in the study design, data collection, analysis, data interpretation, report writing or decision to submit the manuscript. The low energy (calorie) diet manufacturers, (Lipotrim, Howard Foundation, Cambridge) had no involvement in funding the study nor study design, data collection, analysis, data interpretation, report writing or decision to submit the manuscript. Funding: This study was funded by the Vera Down (Neurological Diseases) 2005 and Clark and McMaster (Blinding Diseases) 2005 Awards funded by the British Medical Association, a research and development award 2005 from Sandwell and West Birmingham Hospitals NHS Trust, and by the West Midlands Neuroscience Teaching and Research Fund. AJS is a Brain Trust entry/exit scholar, Ipsen Research Fellow and MRC clinical training fellow (G0601430). The Academic Unit of Ophthalmology is supported by the Birmingham Eye Foundation (Registered (UK) Charity 257549). JWT is a MRC senior clinical fellow. Competing interests: All authors have completed the Unified Competing Interest form at www.icmje.org/coi_disclosure.pdf (available on request from the corresponding author) and declare that (1) no authors have support from companies for the submitted work; (2) none of the authors has relationships with companies that might have an interest in the submitted work in the previous 3 years; (3) their spouses, partners, or children have no financial relationships that may be relevant to the submitted work; and (4) none of the authors has financial interests that may be relevant to the submitted work. Ethical approval: This study was approved by the Dudley local research ethics committee (06/Q2702/64) and informed written consent was given by all participants. Sinclair AJ, Ball AK, Burdon MA, Clarke CE, Stewart PM, Curnow SJ, et al. Exploring the pathogenesis of IIH: an inflammatory perspective. J Neuroimmunol2008;201-2:212-20. Corbett JJ, Savino PJ, Thompson HS, Kansu T, Schatz NJ, Orr LS, et al. Visual loss in pseudotumor cerebri. Follow-up of 57 patients from five to 41 years and a profile of 14 patients with permanent severe visual loss. Arch Neurol1982;39:461-74.
WHO. Global database on body mass index. 2010. http://apps.who.int/bmi/index.jsp. Lueck C, McIlwaine G. Interventions for idiopathic intracranial hypertension. Cochrane Database Syst Rev2005;3:CD003434. Glueck CJ, Aregawi D, Goldenberg N, Golnik KC, Sieve L, Wang P. Idiopathic intracranial hypertension, polycystic-ovary syndrome, and thrombophilia. J Lab Clin Med2005;145:72-82. Newborg B. Pseudotumor cerebri treated by rice reduction diet. Arch Intern Med1974;133:802-7. Kupersmith MJ, Gamell L, Turbin R, Peck V, Spiegel P, Wall M. Effects of weight loss on the course of idiopathic intracranial hypertension in women. Neurology1998;50:1094-8. Johnson LN, Krohel GB, Madsen RW, March GA Jr. The role of weight loss and acetazolamide in the treatment of idiopathic intracranial hypertension (pseudotumor cerebri). Ophthalmology1998;105:2313-7. Wong R, Madill SA, Pandey P, Riordan-Eva P. Idiopathic intracranial hypertension: the association between weight loss and the requirement for systemic treatment. BMC Ophthalmol2007;7:15. Friedman DI, Jacobson DM. Diagnostic criteria for idiopathic intracranial hypertension. Neurology2002;59:1492-5. Tomlinson JW, Moore JS, Clark PM, Holder G, Shakespeare L, Stewart PM. Weight loss increases 11beta-hydroxysteroid dehydrogenase type 1 expression in human adipose tissue. J Clin Endocrinol Metab2004;89:2711-6. Frisen L. Swelling of the optic nerve head: a staging scheme. J Neurol Neurosurg Psychiatry1982;45:13-8. Evers S. [The new IHS classification. Background and structure]. Schmerz2004;18:351-6. Kosinski M, Bayliss MS, Bjorner JB, Ware JE Jr, Garber WH, Batenhorst A, et al. A six-item short-form survey for measuring headache impact: the HIT-6. Qual Life Res2003;12:963-74. Castro DPE, Kawase J, Melo LAS Jr. Learning effect of standard automated perimetry in healthy individuals. Arquivos Brasileiros de Oftalmologia2008;71:523-8. Whiteley W, Al-Shahi R, Warlow CP, Zeidler M, Lueck CJ. CSF opening pressure: reference interval and the effect of body mass index. Neurology2006;67:1690-1. Bynke G, Zemack G, Bynke H, Romner B. Ventriculoperitoneal shunting for idiopathic intracranial hypertension. Neurology2004;63:1314-6. Shin HE, Park JW, Kim YI, Lee KS. Headache impact test-6 (HIT-6) scores for migraine patients: their relation to disability as measured from a headache diary. J Clin Neurol2008;4:158-63. Sacks FM, Bray GA, Carey VJ, Smith SR, Ryan DH, Anton SD, et al. Comparison of weight-loss diets with different compositions of fat, protein, and carbohydrates. N Engl J Med2009;360:859-73. FDA. Orlistat (marketed as Alli and Xenical): early communication about an ongoing safety review. 2009. www.fda.gov/Safety/MedWatch/SafetyInformation/SafetyAlertsforHumanMedicalProducts/ucm180025.htm. Li Z, Maglione M, Tu W, Mojica W, Arterburn D, Shugarman LR, et al. Meta-analysis: pharmacologic treatment of obesity. Ann Intern Med2005;142:532-46. Williams G. Withdrawal of sibutramine in Europe. BMJ2010;340:c824. Çelebisoy N, Gökçay F, Eirin HÖA. Treatment of idiopathic intracranial hypertension: topiramate vs acetazolamide, an open-label study. Acta Neurol Scand2007;116:322-7. Rosenfeld WE. Topiramate: a review of preclinical, pharmacokinetic, and clinical data. Clin Ther1997;19:1294-308. Sugerman HJ, Felton WL 3rd, Salvant JB Jr, Sismanis A, Kellum JM. Effects of surgically induced weight loss on idiopathic intracranial hypertension in morbid obesity. Neurology1995;45:1655-9. Flum DR, Belle SH, King WC, Wahed AS, Berk P, Chapman W, et al. Perioperative safety in the longitudinal assessment of bariatric surgery. N Engl J Med2009;361:445-54. Tamburrelli C, Salgarello T, Caputo CG, Giudiceandrea A, Scullica L. Ultrasonographic evaluation of optic disc swelling: comparison with CSLO in idiopathic intracranial hypertension. Invest Ophthalmol Vis Sci2000;41:2960-6. Rebolleda G, Munoz-Negrete FJ. Follow-up of mild papilledema in idiopathic intracranial hypertension with optical coherence tomography. Invest Ophthalmol Vis Sci2009;50:5197-200. Concato J, Shah N, Horwitz RI. Randomized, controlled trials, observational studies, and the hierarchy of research designs. N Engl J Med2000;342:1887-92.